"All of us are born with a set of instinctive fears - of falling, of the dark, of lobsters, of falling on lobsters in the dark, or speaking before a Rotary Club, and of the words 'Some Assembly Required'"
That quote is hilarious. You have to love Dave Barry. poor lobsters! they don't feed them because they would poop and dirty the tank. Have to agree with the poor lobsters comment. CAnt's say that I spend much time about worrying that I will fall on Lobsters in the dark, but I did wake up one morning to the creeping of a crab which had crawled out of my kids aquarium, apparently I was between it and the ocean it was headed for eek... Such a perfect quote for the photo, Dave Barry is a real hoot! Yummy! I would love to see this for myself. You have to wonder if the stress they feel under that red light makes them taste awful. That is so funny - I heard the name and thought YUM! Then I saw the picture and thought it was a haunted house. I've never been scared of lobsters before. Love the shades of red! giggle,. Perfect for my royal mac and cheese recipe Hugs, Happy WW. I hope you'll join us at the Thursday Favorite Things blog Hop Linky Party tomorrow. 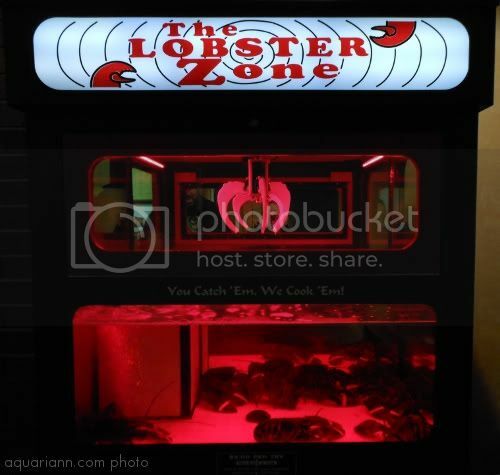 oh.. just realised it is for REAL lobsters.. hmm.. I could never pick out my own lobster. I don't want to see the face of the little guy I'm about to eat! Oooooo, lobsters!!! I LOVE them!!! Mmmmmmm! I am not sure if I should be scared of the lobsters or be scared for them when that claw comes down to grab one.